It can be upsetting to lose a piece of jewellery and expensive to replace a valuable item if you don't have the correct insurance. You can get quotes for Jewellery insurance from companies like Assetsure and Worry+Peace. We've negotiated a 10% discount with Assetsure. What does a good jewellery insurance policy look like? Are there any significant exclusions on jewellery insurance? Will my home insurance cover my jewellery? There are several options when it comes to jewellery cover but the most comprehensive option is a dedicated jewellery insurance policy. Jewellery insurance can cover single items or collections. Most specialists offer a worldwide policy and the best will give you 'All Risks' cover that includes loss, damage and theft. Getting a dedicated jewellery insurance policy might also bring the price of your home insurance down because you won't need to pay more for a higher valuable or single item limit. You can get quotes from jewellery and engagement ring specialists such as Assetsure and Worry+Peace. If you make a claim for a piece of jewellery that is lost or stolen, insurers may offer a replacement, a cash settlement, or give you a Jewellery or Gem Card. You can redeem these cards at jewellery stores across the UK. If your item is damaged, your insurer will decide whether they will pay to repair your item or issue a replacement or cash settlement. The best policies will allow you to choose your own jeweller to help if your item is lost or damaged. It's often better to choose your own jeweller because it can be difficult to replace or recreate bespoke items. Assetsure will either issue you a Gem Card, a cash settlement, or appoint a personal jeweller if your item is damaged beyond repair or lost. If your item can be fixed, they may pay for repairs. As with all insurance policies, there will be some things insurance companies won't be able to cover. It's important to read your policy documents so you know exactly what you're covered for and to make sure you don't purchase too much or too little cover. For example, jewellery insurance won't cover possessions taken from an unattended car or an item lost or damaged while in another person's house unless you're wearing or carrying it. Most policies will only cover you abroad for a certain amount of time. Often this is 60 days. Insurance is not designed to cover routine repairs, servicing, maintenance, cleaning or alteration, or for any damage due to natural ageing or gradual deterioration. Jewellery policies do not cover loss or damage to unmounted stones. It can be worth reviewing your cover limits every few years to take into account changes in gold and silver prices. If there has been a big price increase you could find yourself underinsured. 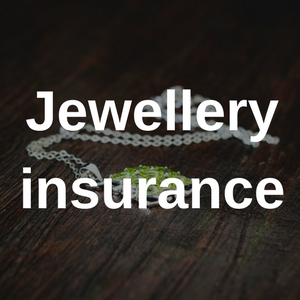 It's difficult to estimate the price of jewellery insurance because it will depend on the item of jewellery itself. As you might expect, expensive items will generally cost more to insure. As a rough guide, we got a quote for an engagement ring on Worry+Peace during August 2017 and found rings worth up to £5,000 cost about £55 a year to insure. We were quoted £175 a year for an engagement ring worth £10,000. While price is an important factor for many people, it shouldn't be the only thing you take into consideration when buying an insurance policy. Make sure you're covered for everything you need and that it's easy to make a claim. Some home insurance policies will provide cover for valuable items such as jewellery. However, it may not be as comprehensive as separate and specialist jewellery insurance. Home insurance policies often have high content limits, but relatively low single items limits. This means everything you own might be insured up to £50,000 in total, but if your single item limit is £1,000 you wouldn't be able to claim for a piece of jewellery worth more than that amount. Generally, single item limits are between £1,000 and £2,500. Some insurance policies do have higher single item limits, though. For instance, Direct Line's Select Premier policy has a single item limit of £10,000. Some insurance companies allow you to add individual items to a policy at an extra cost. You may have to let them know what the item is and how much it is worth. Remember that if you claim for jewellery on home insurance you may lose a no claims discount you have built and your premium may rise at renewal. Some people choose a separate jewellery policy so that any claims will not affect their home policy. Check out our guide to the best home insurance policies. On top of your regular home insurance, some insurance companies offer personal possessions insurance. This can cover items you take outside your home and be extended to include international travel (though if you're abroad, there is usually a time limit - often 60 days). As with standard home insurance, you'll need to make sure the single and valuable item limits are appropriate for your jewellery. Claims may have an impact on your home insurance premium. Because engagement and wedding rings are often the most expensive pieces of jewellery people own some insurers offer separate policies for them. The valuation of a ring can change over time so it's worth finding he current value before getting an insurance quote. Make sure whoever values your jewellery is accredited by the National Association of Goldsmiths. You can get a quote for an engagement ring from Assetsure and Worry+Peace. Watches can be expensive items to replace, especially if you have a luxury brand such as a Rolex or Patek Philippe. Similarly to engagement and wedding rings, you should make sure the valuation of your watch is up to date before you get a policy. Join our watch insurance group to get a 10% discount fom Assetsure. Get a quote from Assetsure for your jewellery insurance. Or if you have a watch you need insured, join our watch insurance group to get a better deal on your insurance.